"No, Ellen will win. Ellen always wins." Two classics of literature, Wuthering Heights and The Count of Monte Cristo are enjoyable to the misanthrope for completely different reasons. In Emily Bronte's novel, it's because all the characters are vile and deserve everything terrible that happens to them; in the Dumas adventure it's the frisson of delight at seeing an utterly Machiavellian plot come together. This classic picture from 20th Century Fox combines these two themes in a memorable vehicle for the stunning Gene Tierney that, while not quite standing up to these literary antecedents, is certainly memorable and vicious in its own right. 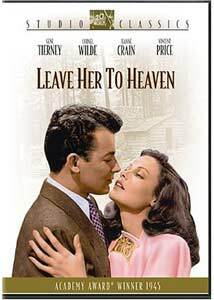 Successful novelist Richard Harland (Cornel Wilde) casually meets Ellen Berent (Tierney) on a train, and he quickly falls under her spell. Ellen, recognizing a good thing when she sees it, quickly dumps her fiancé, aspiring district attorney Russell Quinton (Vincent Price) to corral Richard in marriage. It's an accomplished fact almost before Richard is aware of it, but he's not one to turn down a gorgeous package like Ellen. Things become complicated, however, when Richard's younger brother, Danny (Darryl Hickman), crippled with polio, needs attention, and Ellen's mother (Mary Philips) and adopted sister Ruth (Jeanne Crain) come to visit. Ellen's possessiveness soon turns into obsessiveness and paranoia, and before long the bodies start to stack up. Even when she's caught, Ellen still has her most complex plot up her sleeve. Tierney always seemed a bit cold and off-putting in her films, which makes her the perfect choice for the sociopathic Ellen. Her Ice Queen charms are finely tailored to a part that requires her to be utterly two-faced, manipulative and vicious to an extreme. Cornel Wilde makes for a great befuddled husband who can't piece together what his wife is up to (though that trait does seem odd for a novelist). Price is reliable as always as the district attorney who still longs for Ellen. Jeanne Crain is a bit weak, not quite measuring up to the other intimidating talents on display, though in her defense the part is a bit thinly written as well. Chill Wills also puts in an enjoyable appearance as Richard's friend and confidante. Almost the entire story is told in the form of an extended flashback. The first half of the picture is devoted to setting up the situation and the character of Ellen, as well as darkly hinting that not all is well inside her head. An oddly possessive relationship with her father is mentioned more than once, leading to the (unspoken) possibility of an incestuous relationship triggering her dissociation. Whatever the psychiatric evaluation, there's plenty for Dr. Freud to dig into here, as the interfamilial relationships all betray a severe psychosexual dysfunction. Few of the characters display any redeeming qualities; Ellen's nastiness is only the most blatant example. Richard is almost willfully clueless about her conduct, while the seemingly innocent Ruth is more than willing to take on an adulterous relationship with him. Mrs. Berent is another member of the conspiracy of silence, obviously aware of Ellen's cruelty but saying nothing, which is the same attitude taken by family friend Glen Robie (Ray Collins). Even the family doctor becomes a member of this conspiracy, keeping his mouth shut even after he comes to believe that Ellen means harm to young Danny. While he is fairly innocent, as is Wills' Leick Thorne, both of them manage to provoke Ellen's jealousy and irrationality, triggering the catastrophes of the second half of the picture. Worst of all is D.A. Quinton, who uses his position to persecute Richard for stealing away the woman he loved (and still loves). Much of the film's suspense derives not from finding out what is to happen, but knowing deep down that Ellen means to do harm to anyone who comes in her way, and watching how her evil plots come together. As such, it's entertaining fun that leaves one feeling a little ashamed. Even though it's shot in sun-dappled Technicolor, it has the dark feeling of a film noir with a sharp edge, touching on such verboten issues as abortion and suicide. How the Breen Office ever allowed this to pass without major cuts is somewhat mystifying, but the end result is so good one can only be grateful that it somehow managed to slip through the system. The film is beautifully shot, with delicate interplay of light and shadow and gorgeous framing that frequently looks like a Vermeer come to life, making an intriguing contrast to the harsh thematic material. Image Transfer Review: The original full-frame picture looks incredibly nice, with a subtle Technicolor look that keeps it firmly anchored in its time period; it's not the bright and overly-saturated color that one usually thinks of when thinking of three-strip Technicolor, but a much subtler palette that's reproduced beautifully. No artifacting or edge enhancement was noted. Very attractive indeed. Audio Transfer Review: The weak point of this transfer is the audio track; it's full of quite a bit of hiss, crackle and noise, on occasion becoming obtrusive. Alfred Newman's score is predictably lacking in range, especially in deep bass. It's passable for its age but nothing more. Extras Review: The commentary is an edited-together compilation of comments from supporting actor Darryl Hickman and Time movie reviewer Richard Schickel. While Schickel tends to narrate and has little useful to add, Hickman's comments are fascinating. He not only has plenty of tales to tell about being a child actor in the studio system, with recollections of Shirley Temple, Elizabeth Taylor, and Roddy McDowall, but today he teaches acting, so he's uniquely qualified to comment. He's able to combine memories of the filming with a knowledgeable critique of the limitations of Tierney's acting skills. At the same time, he has a fine appreciation for the character work of Chill Wills, so it's not just a snooty analysis. Thankfully, Hickman dominates the commentary track. There's also a Movietone newsreel of clips from the premiere and the Oscar ceremony where the film won for Best Cinematography. Finally, there's a restoration featurette that provides a comparison to the previous video transfer. Well up to the standards of the Studio Classics series. A classic of the darkest side of human nature, with an excellent video transfer and a first-rate commentary that hits some unusual topics. Highly recommended.